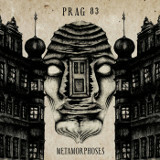 Dark folk outfit Prag 83's debut album isn't a particularly loud album; a lot of the time the music sounds like it's coming from a distant radio, the vocals a slack buzz against the minor-key picking. But each has its own special atmosphere, an echoing aura of depth to all of them. The album is based on the works of Franz Kafka; having only read two of Kafka's books, I can't really say if Metamorphoses truly captures the essence of the stories, but I can certainly imagine it as the soundtrack to the scenarios that unfold in them. The production is low-key and heavily guitar-oriented, with a little drumming thrown in for accent, toned down almost to finger-snap volume. The vocals are dull, soft things that murmur against a guitar track that sometimes plays all-acoustic, such as on Nachts, and other times plays with a twangy chorus/delay pedal combo, such as on The Hunger Artist. Though many of the songs are instrumental only, when one-man band Herr K. does sing, he has a gentle, finely calibrated voice, layered slightly on the songs for a bit more effect, that is devoid of any sharp edges. The Devil's Heart, a simple folk song driven by his guitar picking and voice, is one of the strongest songs of the lot, having a lot less acoustic wandering than most of the more ambient tracks. The best is saved for last, though: Metamorphosis, based on the most well-known Kafka story, is also the most metal-oriented, with buzzing, distorted guitars, turned down to the same distant quiet of everything else, churning out a melodic but depressive set of chords to the sound of Herr K.'s singing, ending with soft, drawn-out acoustic chords. Metamorphoses turned out to be very nicely done, though it's best for periods when one wants some introspective music to listen to late at night -- don't expect headbanging material here. Anyone who liked the atmosphere of Tusen år Under Jord's Sorgsendömet Fobos will probably enjoy this one too, as they have some similarities.